Updated. At the BlackBerry 10 launch event last week, Skype(s msft) was mentioned as one of the apps “committed” to the new BB 10(s bbry) platform. The app isn’t here yet, but there’s news about it: Skype for BlackBerry 10 will be a port of Skype for Android, per Skype’s own support page. The Verge spotted the information and notes that the supported Android runtimes for BB 10 are based on Android 2.3.3, which are more than two years old. That means Skype for BlackBerry 10 — or any other Android port, for that matter — won’t have all of the modern feature or functions of a Android application supporting Android 4.0 or better. Earlier this week, BlackBerry said that Android 4.1 runtime support could become available in a future update. So once Skype for BlackBerry 10 does appear, don’t be surprised if it looks and feels a little different from the current Android app. Having attended the BlackBerry 10 event, I’ll admit to feeling a little misled. When a company says it has application commitments for Skype, Amazon Kindle(s amzn) and other apps, I think it reasonable to expect it means native applications. And what does it say that certain developers are simply going to port an existing app instead of optimizing their software for the platform? I see it as a general lack of confidence in the platform, although to be fair to BlackBerry, in this case, that developer is a close competitor: Microsoft. I’ll be very curious to see when other high-profile apps that committed to the platform actually deliver the goods. Will they bring old Android apps or actually invest themselves in BlackBerry 10? I hope skype but also spotify will come asap. This are great app and skype for pro is usefull. No surprise here. I heard so mention that upwards of 70% of the apps Blackberry is releasing with are Android ports. or for that matter any other service. They have really upset a lot of Skype users ( I am one of them ) who are also BB users ( I am also one of them), .Unfortunately Face Flow does not have the user base and OoVoo, I do not know about but will look into it. I do not like being played for a pawn and will drop Skype the first good opportunity I have. I wonder if Skype finally decided to play fair in the sandbox because it does not want to see Face Flow gain any traction? 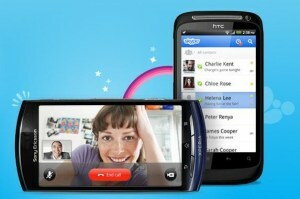 OoVoo is coming with a native version for BB10. It will be way better than the rest. New video compression and features much like the BBM video with sharing. It is also available on all other platforms already. All the rest will fall in line and offer a BB10 version or fall off the cliff. And to all the BB10 detractors it is the most powerful mobile platform period. It can run most Android apps perfectly, while Android will never be able to run a native BB10 app. Loving my Z10, who cares about Skype. FaceFlow was the first text and video chat platform on the Blackberry 10, and is still the only one there. Props to them. They are also seeing over 700 installs/day. Who gives a crap? Why does it matter what Android version it will run on? Seeing as around half of the Android users are running Gingerbread anyway, I’m sure it will be just as good as Skype on any other platform. Ya I am sure once some sales figures roll out a full BB10 Skype app client will be written. The phone hasnâ€™t launched in the USA yet, and itâ€™s very easy to port apps for android to work on BB10â€²s emulator, so makes sense to quickly get this out for UK and Canadian customers and if the phone takes off in the US, write a proper native app. Seriously the salivating bloggers and â€œjournalistsâ€ in the tech community need to stop looking so hard for BB10 flaws. Why not concentrate on all the new positives. Even if you hate Blackberry (which would be ridiculous if you ask me), having them a stronger player in the marketplace, will cause cheaper iPhones and Android phones and maybe cause them to pull up their socks and do more innovation than just tacking a new number on the end of their OSâ€™s. Sounds awful that the user experience will only be Android good instead of BB10 good. Hopefully though, they will eventually upgrade it. I hope Blackberry gets it’s act together, and is able to start pushing things out at a more accelerated pace. They need to spend the money to get BB10 specific apps. Otherwise why not go to a garage sale and get an old Galaxy Nexus for a third the cost of an out of contract Z10. The good news is BlackBerry is updating the Android runtime layer to Android 4.1 Jelly Bean. All the world needs is a little patience. Here is a meetup about doing this type of thing next week.